Domenique is a Dutch artist working and living in Amsterdam. His studio is part of the NDSM Treehouse. Domenique's work is focused in performance through social practice. His aim is to engage and influence his community. I talked with Domenique about two of his social practice pieces, Het Monument Voor Prima Mensen / The Monument for Okay People and One Hour of Free Help / Embassy of Goodwill. Around 7 years ago, I had this thought, ‘I don’t need to make art.’ I was already surrounded by talented people making beautiful work. I could see the act of promoting other inspiring people could be my main goal; it could be my practice. A Monument for Okay People would be the ultimate homage to the people who inspire me. I have since found a need to make my own work, but making this homage to okay people was a very exciting project and continues to be an exciting idea for myself. 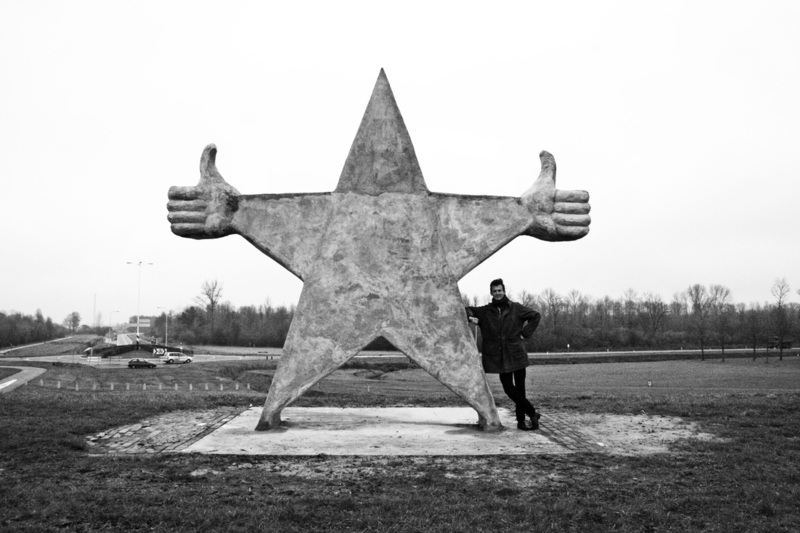 These days I say that the Monument For Okay People is an alternative for social media. I see that in these last decades, social meeting places moved from public space to the digital domain. With this project, I translate the benefits of social media back to public space in the form of an ultimate like to the people I adore. In this sense, it’s not a static artwork but a way to bind people together. On the other hand, its a diplomatic tool to thank all the people who have helped me with projects, exhibiting and writing about my work. I like the tension between optimistic thanking and diplomacy. Who am I to eternalize people, does that mean that I exclude other people? Or you could see this concept as a franchise, everybody can make Monuments for okay people. It's built on a dike in Flevoland at the Flevomeer (lake). Flevoland is a region in the middle of the Netherlands that has only existed for 60 years. To make this land they pumped some of the water of the central lake/sea of the Netherlands away, so Flevoland is under the sea level. There are some cities in Flevoland, but mainly it is used for agricultural purposes.
" This will repeat this, once a year, as a sort of Pagan ritual for okay people. " The project was funded by local entrepreneurs and the regional water governance organ (excuse me, I don’t know the English name for it). The project needed to have a lot of volunteers or would otherwise be impossible. Long live the okay people, especially, those people who helped! The building of the sculpture was the first phase of the monument, next year the second phase will start. I will be selecting some okay people, engraving and casting their names in tiles and attaching the tiles around the sculpture. This will repeat this once a year as a sort of Pagan ritual once a year for okay people. 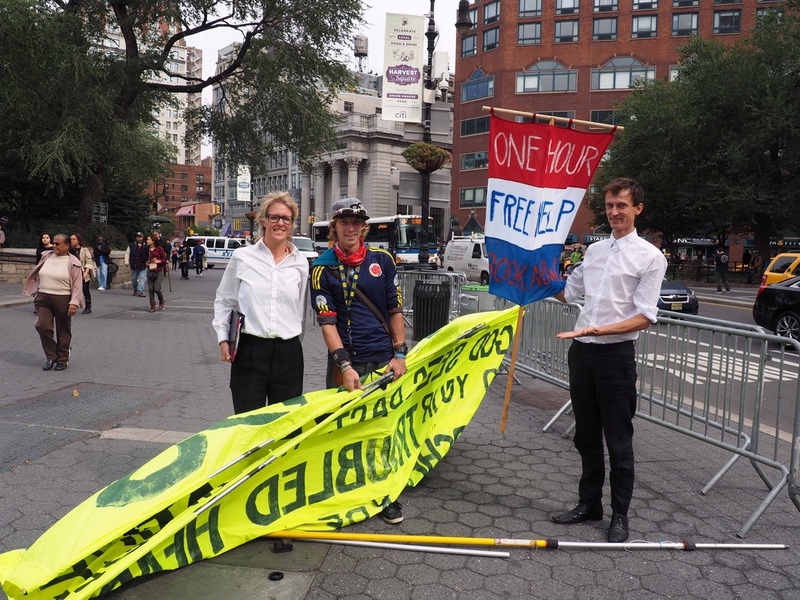 After the summer madness of constructing the Monument for Okay People, a colleague artist Marieke Warmelink and I participated in the New York public art and performance festival Art In Odd Places. A festival on 14th street where more than 70 artists did artistic and social interventions. We state that The Netherlands is losing it's social reputation. There is a growing fear of dissidents. So we, as social artists should offer our help to the citizens of other countries to reclaim our social reputation. We did this under the name Embassy of Goodwill. During the festival we stayed on union square and for most of the time we gave advice. The people we helped came from all kind of backgrounds, from paperless immigrants to homeless guys, artists to tennis instructors, etc. By offering help without aiming for something back, you get the trust of people, this makes it possible to make connections that are normally not possible. Normally, you stay as a foreigner in a new city; on the surface of the city. Offering help makes it possible to start communicating with the people, it injects you through the surface and gives you a real connection. It creates adventures and gives you access to stories you never would hear. During the festival we also took bookings for the next week. The reactions were from being amazed to understanding, never negative. A noteworthy experience is that we helped a random passerby with rearranging his room. Afterwards a friend from Amsterdam told me that he was her best friend.
" Normally, you stay as a foreigner in a new city; on the surface of the city. Offering help makes it possible to start communicating with the people, it injects you through the surface and gives you a real connection. " Some years ago, I offered my help to the citizens of Amsterdam. I had just moved to Amsterdam and I was taking a research course in social design. Artists and designers were asked to reflect on social questions, one of these questions was from a rental agency - "how to reach the unreachable citizen". My colleagues and I reflected on the question and realized that there was some distance between the theory and the society. I decided to bridge the gap. I chose to offer my help, for free. I ended up getting an article on a newspaper's front page with ONE HOUR OF FREE HELP and there came a wave of reactions. For two months I helped people. The requests for help came from all the layers of society, from rich to poor, from socially open to isolated people. This project was a sort of self-integration course. After this project, Amsterdam felt like my city. I had wove my story into the stories of the people who are this city. The answer that we came to, for the rental agency, was that I came into contact with these unreachables because I didn't have an agenda. That opening these avenues to connect are only possible when you don’t need anything. Helping as a performance art practice could take a lot of forms and goals. So I’m sure that I'll do HELP projects in the future!